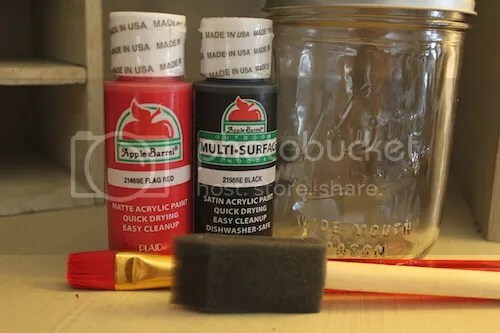 Step 1 – Tape off half of the jar so you can get a nice straight line when you paint and so you don’t get the paint on the other half. Once you’ve taped off the one jar, you are ready to paint. 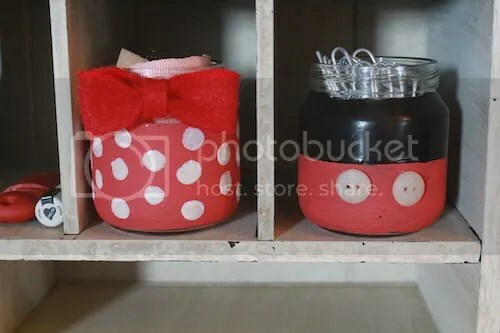 Step 2 – Paint your jars. I started with the red first. 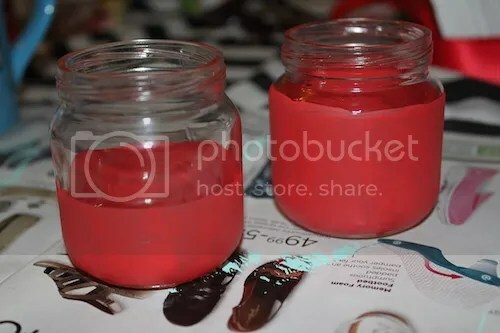 I painted one whole jar red and the bottom half of the other jar red. 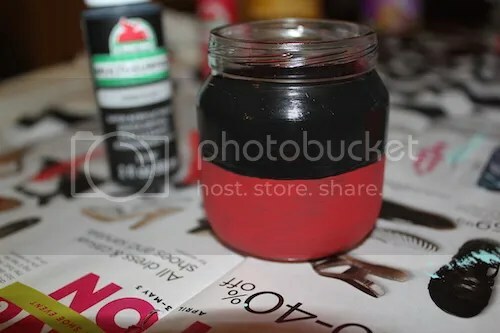 Let them dry, then once you have finished paint the other half of the one jar black. 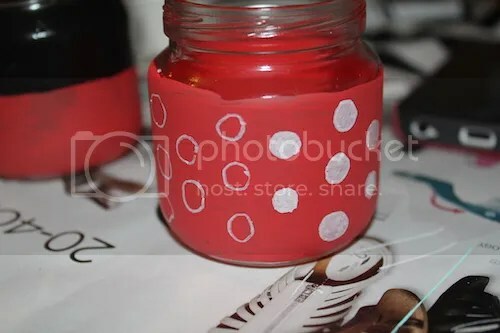 Step 3 – After the paint has fully dried on both jars, it’s time to glue the buttons and paint the polka dots. I used an old white nail polish pen and puff paint for the polka dots. I starting running out of the nail polish, so I switched to puff paint. Step 4 – After you have painted the dots, let them dry. 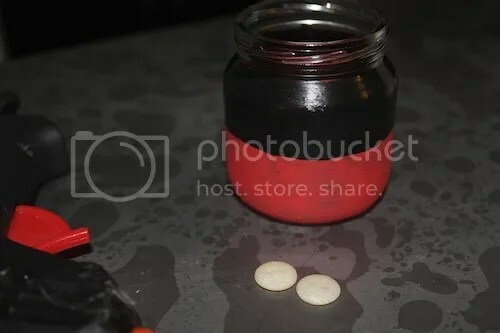 While that jar is drying, glue the buttons on the Mickey jar with your glue gun. I made sure to mark with pencil where I want the buttons to go so it looks as perfect and even as I can get it. 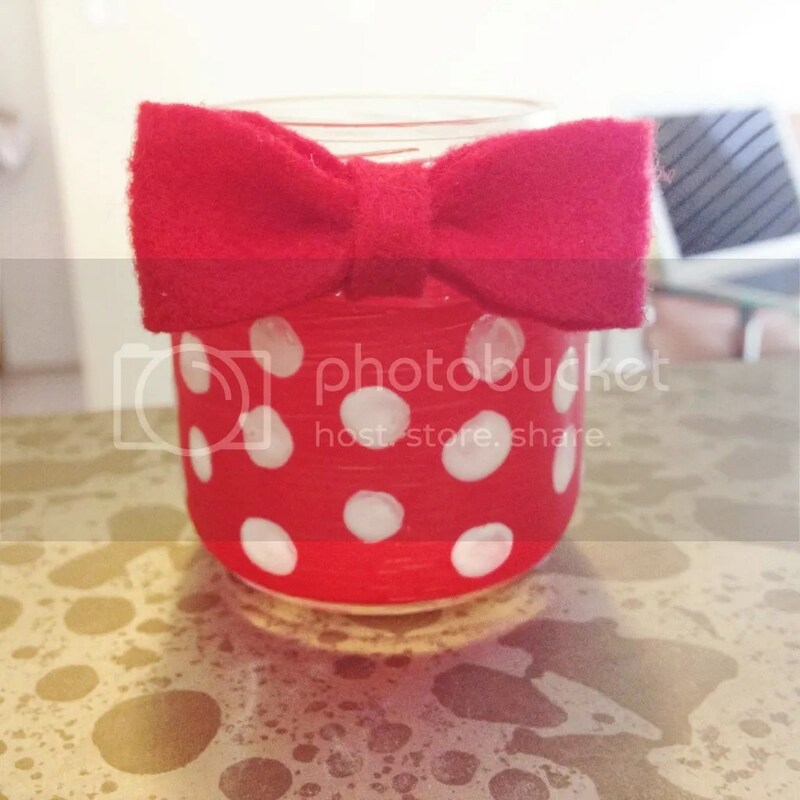 Step 5 – Once you’ve attached the buttons for the Mickey jar, get your red bow and hot glue it to the Minnie jar. You can use any bow you want, or you don’t have to even glue a bow on. This was a last minute decision as I was making the jars. It just felt a little more Minnie with a bow on it than with just plain polka dots. I ended up making this one out of felt. Step 6– Display your jars! I used one as a paperclip holder for my desk and the other one for just some random stuff right now. Hope you enjoy, and if you have any questions feel free to leave them below! And if you decide to take on this DIY project, I would love to see your results!